You're so right that time has a different meaning when you have a chronic illness. I bet there's even more you have to say about it-how about a companion poem? 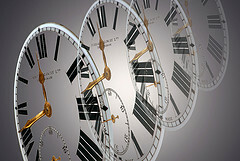 Maybe looking at time from a different perspective such as accomplishment, energy or pain? Nice thoughts! Join in and write your own page! It's easy to do. How? Simply click here to return to Want to Share a Poem About MS?.